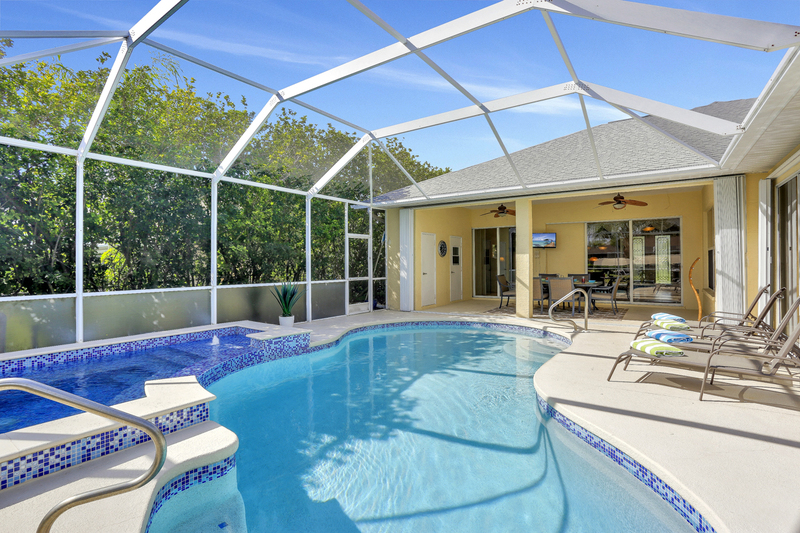 This 3 bedroom/3 full ensuite bathroom waterfront pool home features 2 spacious living areas, one of which is a Games Room with pool table, an open plan Kitchen with stainless steel appliances including wine cooler, very private pool area with huge 8 seater sunken spa and poolside flat screen cable TV so you can watch TV whilst in the pool! This home is the perfect choice for guests seeking a luxury home with every possible amenity for the ultimate vacation experience. Thanks for letting us share this wonderful experience. We were here to celebrate our 50th birthday. Our days were filled with shopping, sunshine and plenty of laughter. The evenings were spent at Serenity Star in the spa, pool and inside the beautiful villa. We could not have asked for a better week. Can't wait to celebrate our 60th ..... Thanks from the Millers! 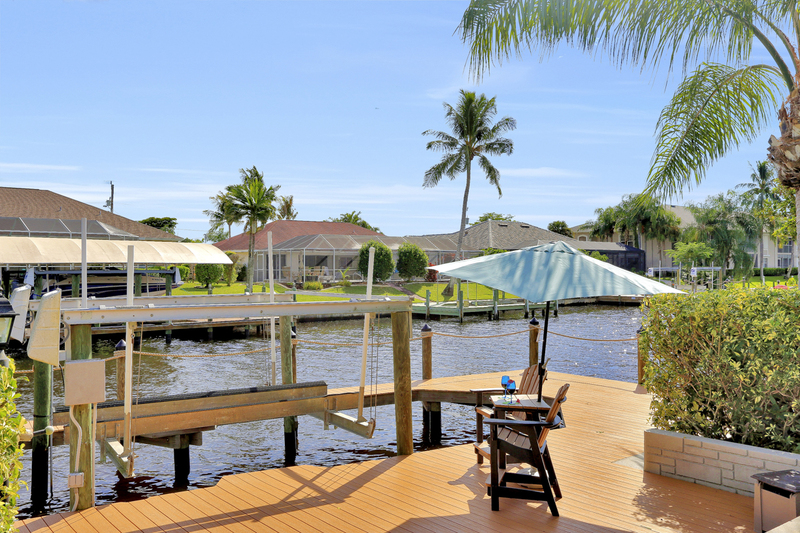 After spending two very busy weeks in Kissimmee we were looking forward to a week of relaxation in Cape Coral. Villa Serenity Star looked amazing on the website but that didn't do it justice! The villa surpassed our wildest dreams from the moment we stepped inside.......and we spent the first ten minutes walking around oohing and aahing! !The layout is spacious yet homely, a huge kitchen stocked with every utensil imaginable, cozy living area with a huge tv and a pool table to keep the boys amused....what more would anyone want?The bedrooms are beautifully furnished all with en suite bathrooms, and an abundance of fluffy white towels in all sizes. As for the huge pool with the inviting spa, the great bbq and the comfortable under cover dining area, complete with tv, what can I say....we loved it all!! We also had plenty of huge beach towels to wrap up in after lounging in the pool.Did I mention the dock? Our grandsons spent ages sitting patiently, fishing rods in hand, waiting to catch dinner but all they managed was a baby catfish! !We loved the area around Cape Coral, we went to Ft. Myers and Sanibel. where the kids went for a swim in the warm ocean and collected a few of the shells covering the sand. We found lots of places to shop and took a walk at sunset along the pier looking for dolphins. We had a wonderful week in this delightful villa and would go back again in a heart beat. 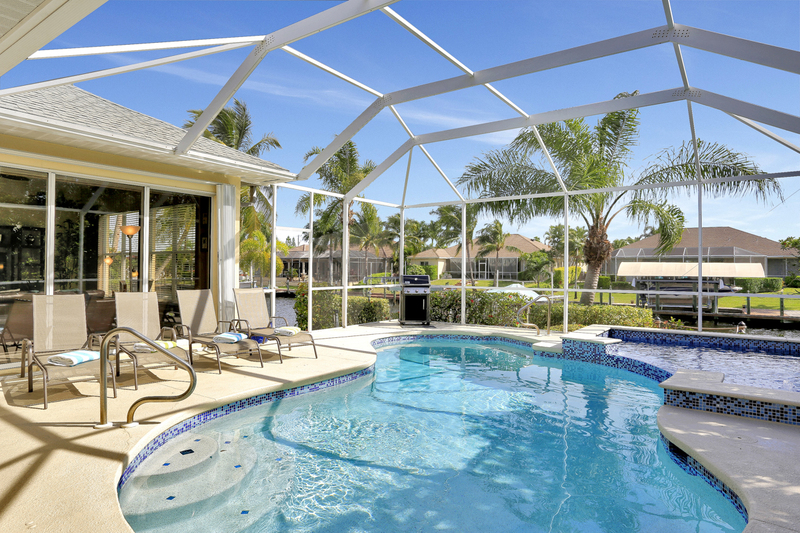 We enjoyed our two weeks at the Serenity Star in Cape Coral. Fantastic views of the canal , pool and Spa .Plus they were a hit with the family.The accomodations and amenities met and exceeded our needs. This is our 6th visit to the area and so far one of the best rentals and Neil and Keely made the process smooth and efficient. I would highly recommend Churchill for future vacation considerations. The home we stayed in was extremely nice. We had such a great time that the only people I will talk to about rentals is Neil and Keely Hastie. 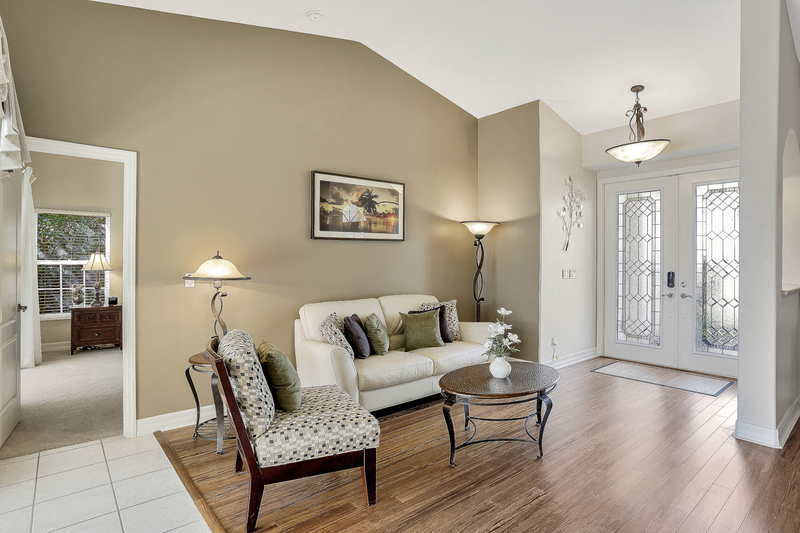 Churchill Properties is the best property management business to use. The Best!!! We will be back!!! We absolutely loved Villa Serenity Star, had everything we needed. Hopefully will be back again June 2013. 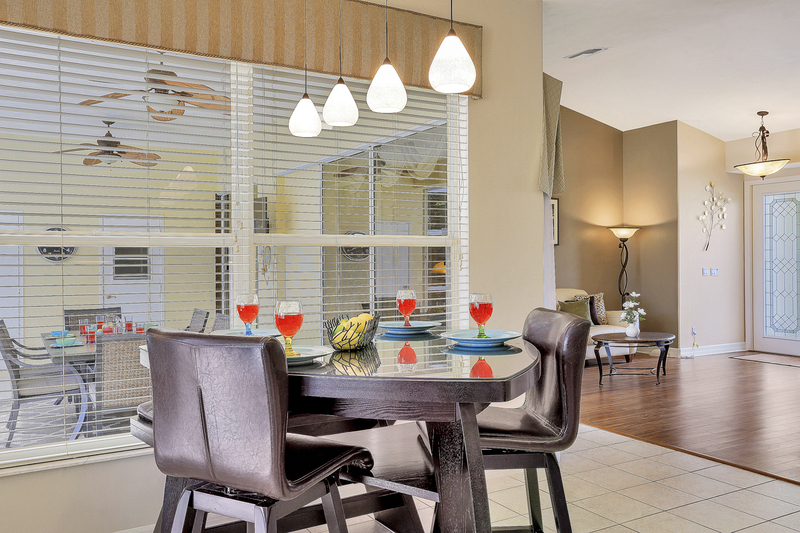 Beautifully decorated, extremely comfortable and the kitchen was fully equipped. Laundry room had top quality washer/dryer. The pool, hot tub and dock is where we spent most of our time. Great fishing from the dock, caught a small stingray, puffer fish and many catfish, of course catch and release. Also, the morning we were leaving a group of manatees were in the canal directly across from us. Unbelievable! This house had everything and more! The location was great, the view was fantastic. We had a fabulous stay! 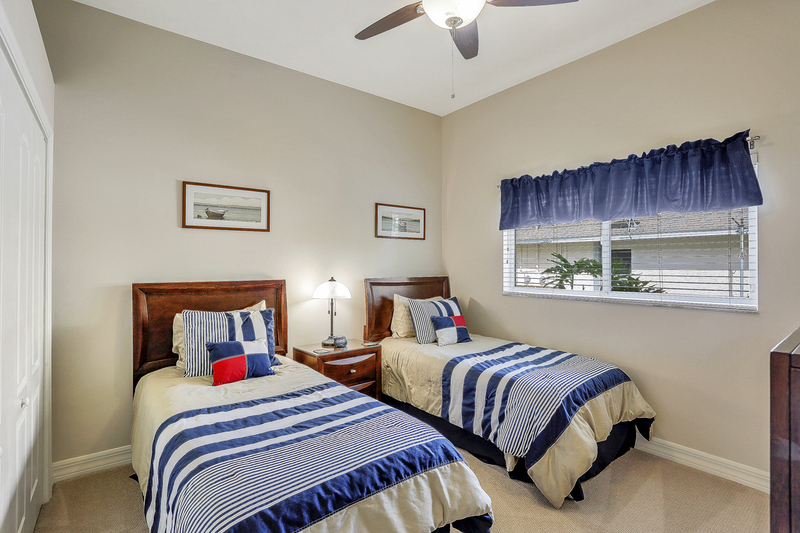 The house is tastefully furnished and includes all amenities needed for a worry free vacation. The large spa attached to the heated pool is great. 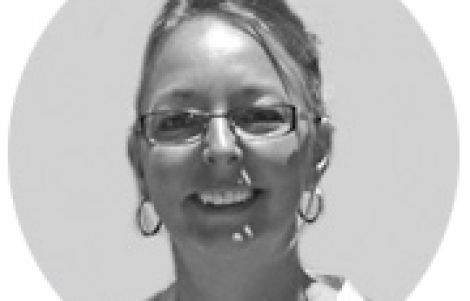 Keely and Neil are easy to deal with and are very quick to respond to any questions or concerns that may arise. This house was perfect for our family. It had everything we could possibly need for a week-long vacation. It was clean, updated, and spacious. The management company was also very easy to work with. We rent a lot of vacation houses, and I give this one an A+. We stayed here for a week in April and it was lovely. Home is well equipped for those who want to prepare meals at home - it didn't lack for any kitchen equipment that we needed. House was a great set up for two couples with an extra bedroom and bath for any children along for the vacation. Extra pool bath was a bonus. Beds were comfy and linens were plentiful and of good quality. Wouldn't hesitate to recommend or stay here again. Keely was a pleasure to work with and was most accommodating. Great rental - great stay! 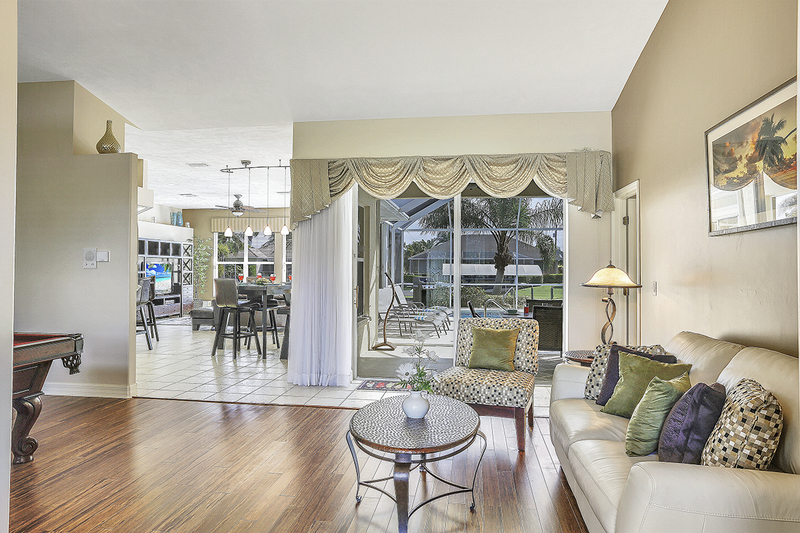 This beautiful home was set up with instructions to maximize all of its amenity's. The area is very relaxing with many restaurants to choose from. We rented a boat and enjoyed the full feeling of this boating community. We will be back next year. My wife and I loved our stay at the Serenity Star. The home is furnished beautifully, the open floor concept provided the ability to cook in the kitchen and be able to interact with others sitting in the living room or at the counter. The Bose surround system provided a movie theater like experience. The pool and spa were used throughout our stay and the fishing off the dock was relaxing. We especially enjoyed the interaction between the passing boaters traveling through the canal. We look forward to returning for April and March of 2019. Everything one needs is close by in the forms of entertainment at Cape Harbor or the restaurants . One new bakery to the immediate area is Canolli's which has an assortment of fresh made italian deserts , breads and wines. 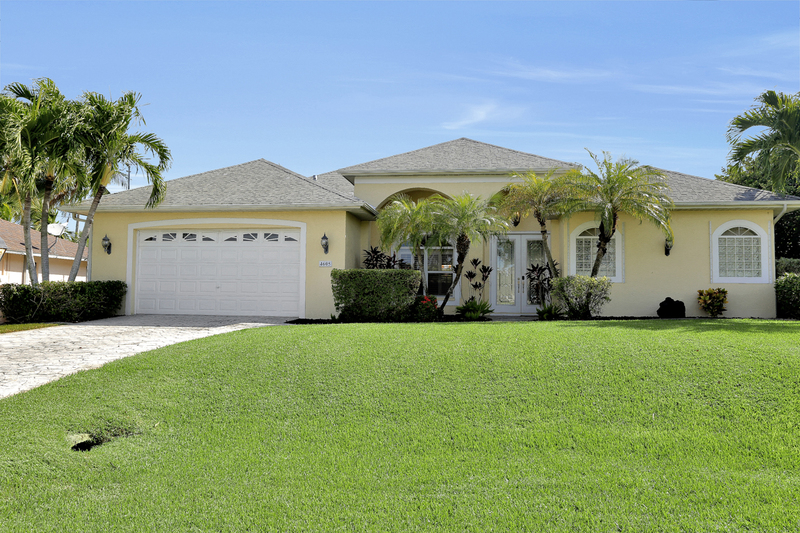 Villa Serenity Star is a lovely home in a nice residential neighborhood. 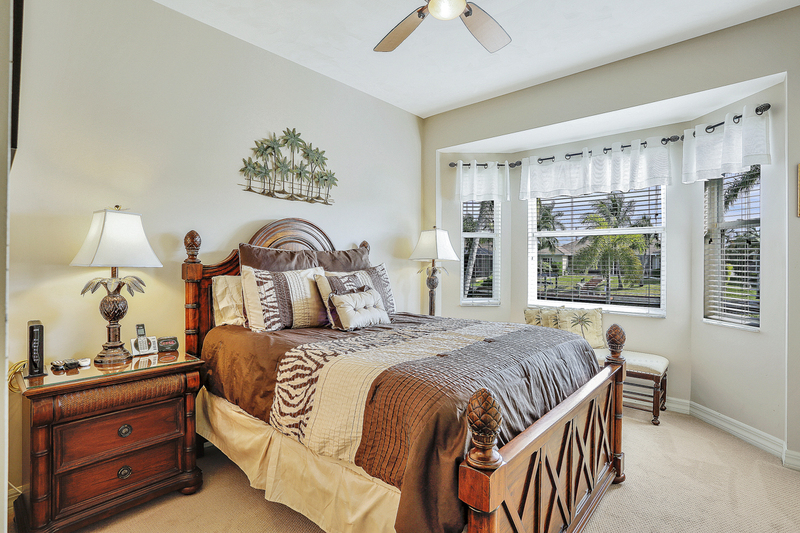 The immaculate home is very comfortable with upscale decorative touches. 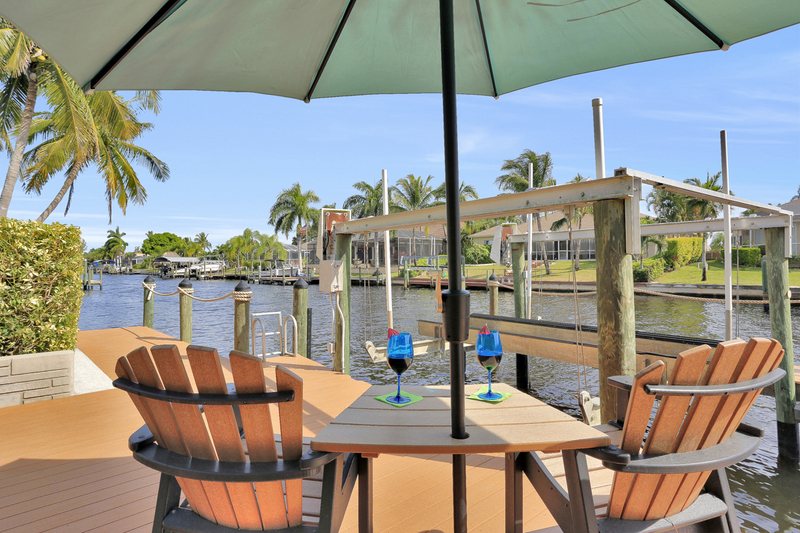 We enjoyed drinks on the dock area on the canal in the evenings and coffee around the beautiful pool each morning. 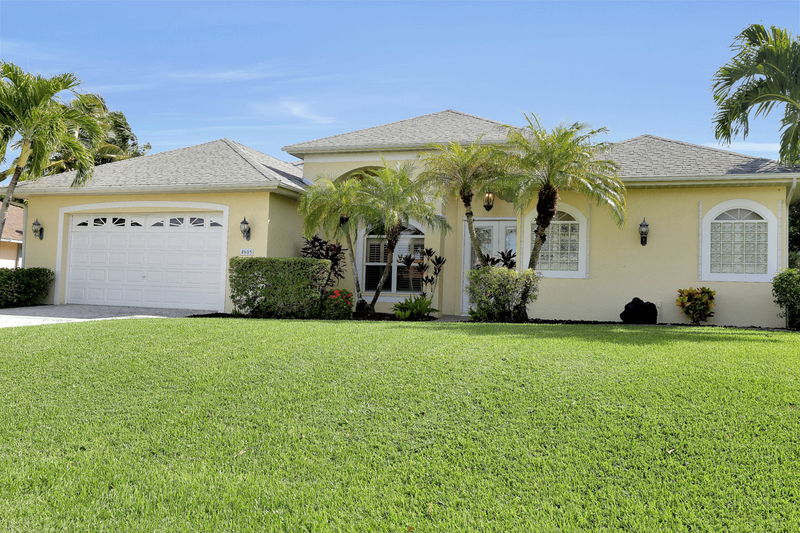 The location is conveniently close to everything and the host is very friendly and accommodating. I would recommend this property and would definitely stay here again. We liked it very much. A really nice house with all comfort. 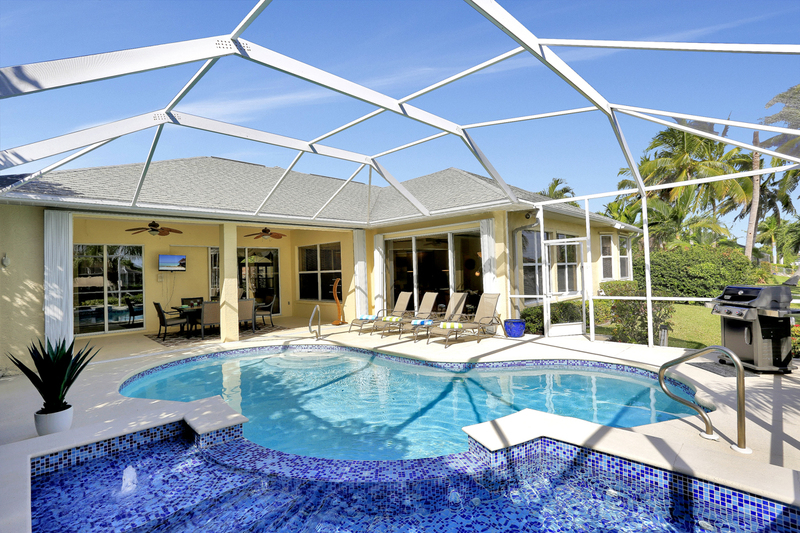 When we return to Cape Coral we will rent this house again. 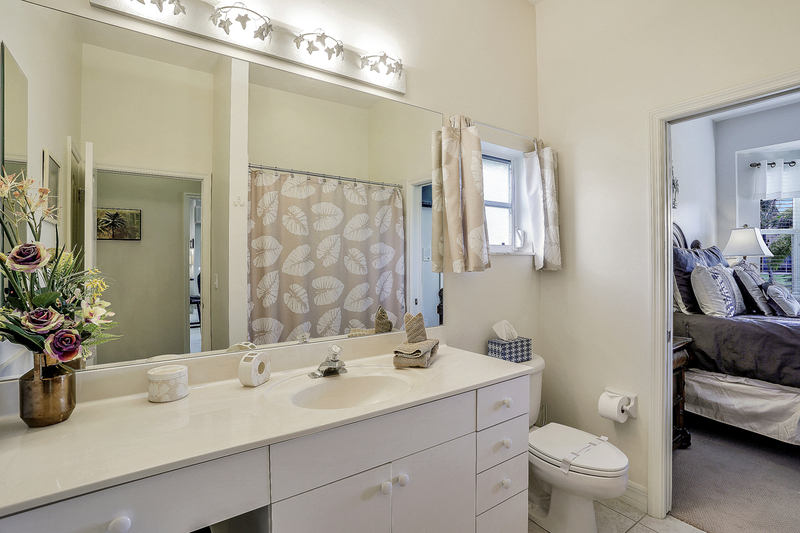 Private ensuite bathroom with walk in shower, twin basins & sunken jetted bath tub. Hairdryer provided. 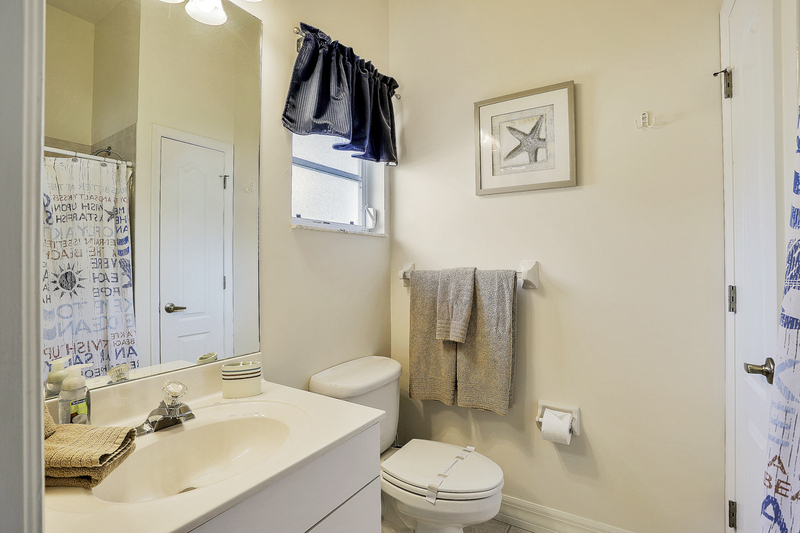 Private ensuite bathroom servicing Guest Bedroom 2 with basin & bath tub/shower combo. Hairdryer provided. Private ensuite bathroom servicing Guest Bedroom 3 with basin & walk in shower. Hairdryer provided. 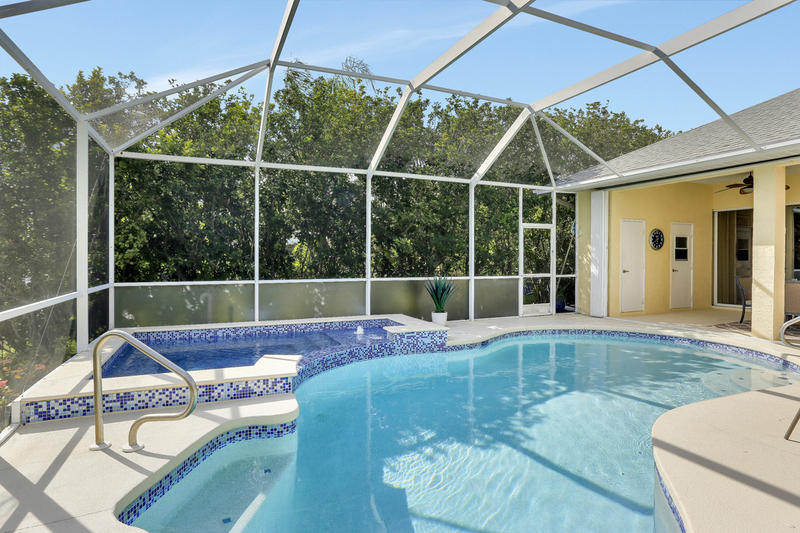 Poolside private bathroom with toilet & basin for extra convenience; no more wet feet in the house! Furnished as a Games Room - Entertainment for all the family! 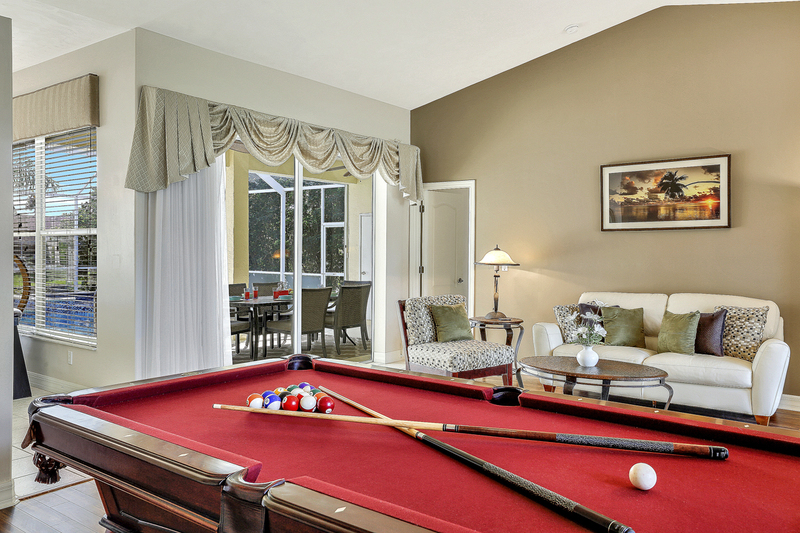 Equipped with a pool table and comfortably furnished with sofas for everyone to enjoy! Open plan design & furnished to a modern style with comfy leather sectional sofa & chairs. 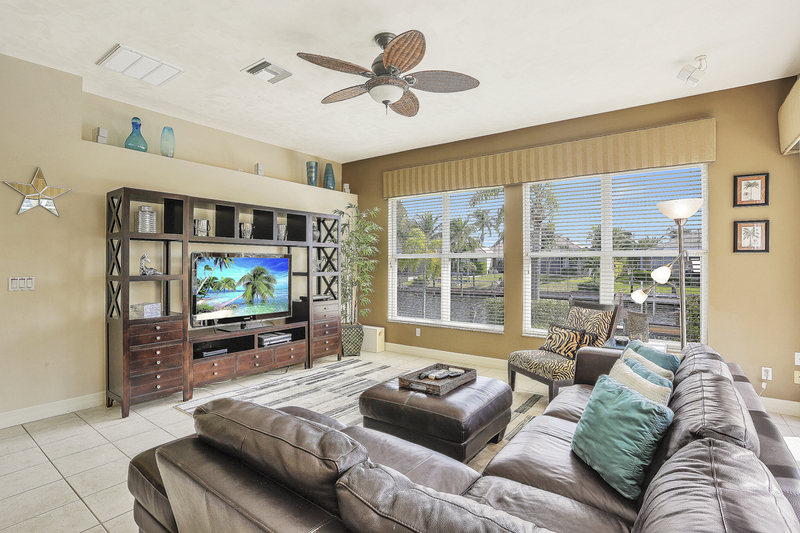 Equipped with 50" flat screen HD cable TV, DVD player & Bose surround sound system. DVD Library with over 50 films available. 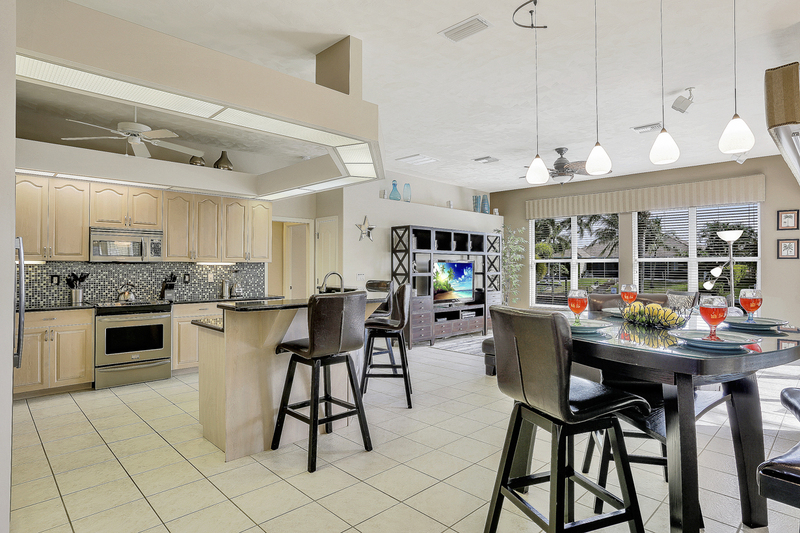 Open plan kitchen overlooking Family Room & pool. 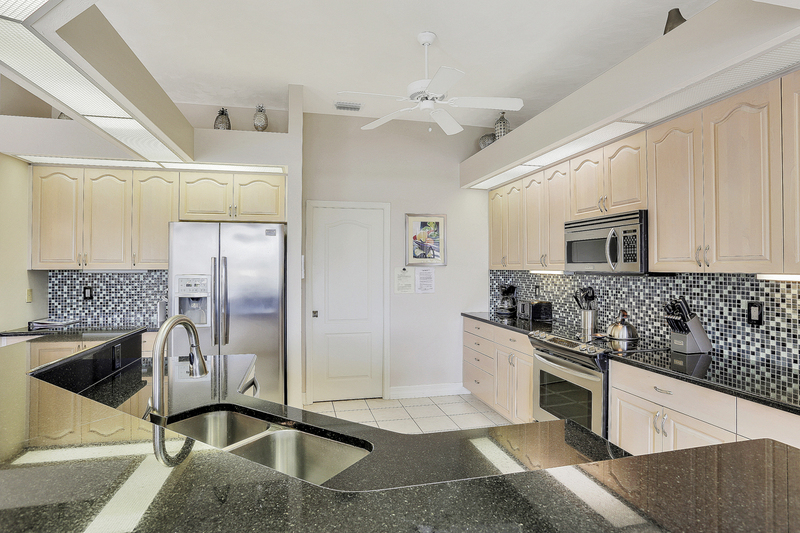 Fully equipped with stainless steel appliances including wine cooler & cooking utensils. Also Gas BBQ in lanai area for al-fresco cooking in the sun! 2 Car. Beach Chairs & Umbrella provided. Electrically heated with LED mood lighting system so pool changes colour! 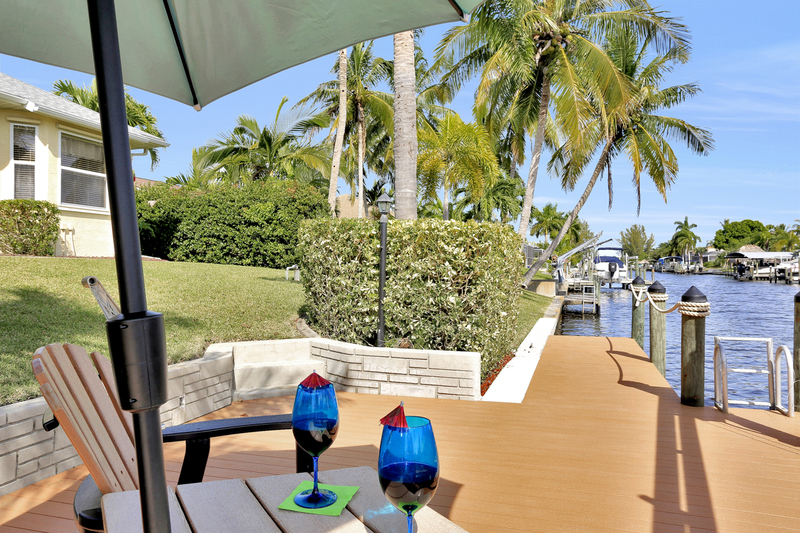 Villa Serenity Star is the perfect upscale residence in the popular Cape Harbour area of Cape Coral. Special luxury touches include all bedrooms come complete with their own private en-suite bathroom, granite countertops, wine cooler, games room, Bose surround sound in Family Room, flat screen TV on outdoor lanai, and huge 8 seater sunken spa with remote LED mood lighting feature for night-time fun in the pool and spa! 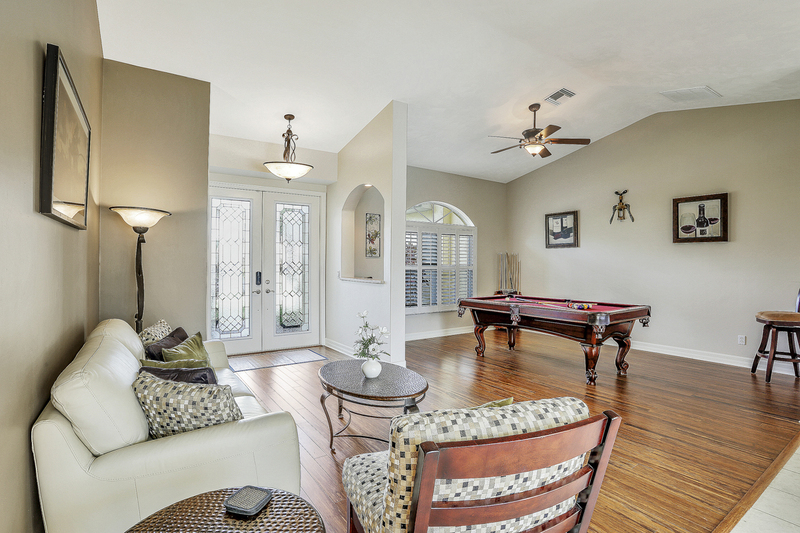 On stepping through the double-door entrance you will be greeted with the spacious Games Room. 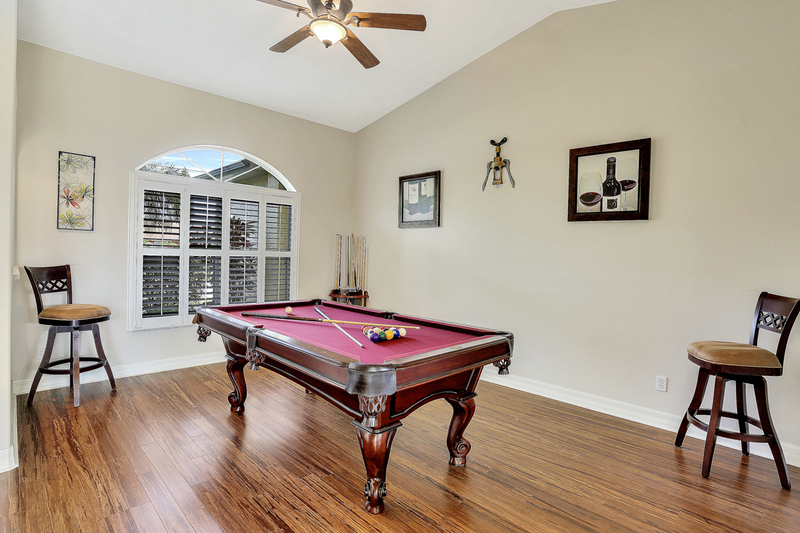 Finished with a warm, natural hardwood floor, the room features a professional pool table, plenty of seating for players and supporters alike and sliding doors providing access and views to the pool and spa area. 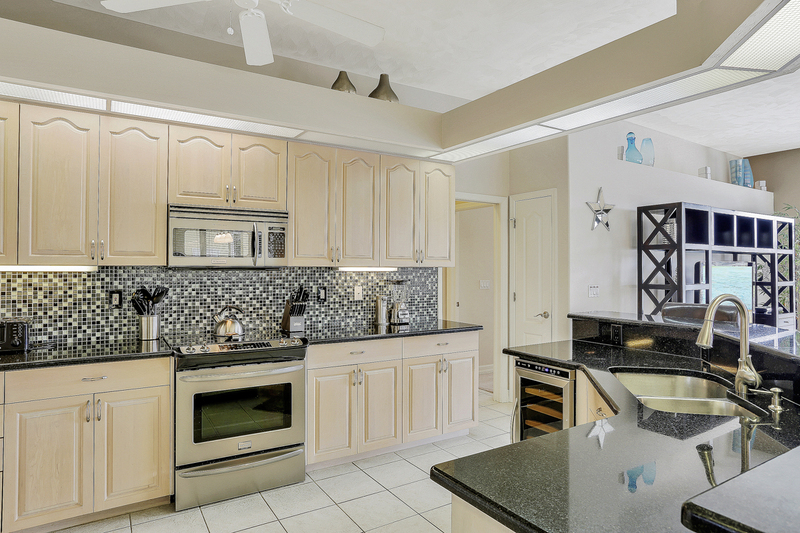 The Kitchen has been completely modernized with sleek black granite worktops and glass mosaic backsplash. 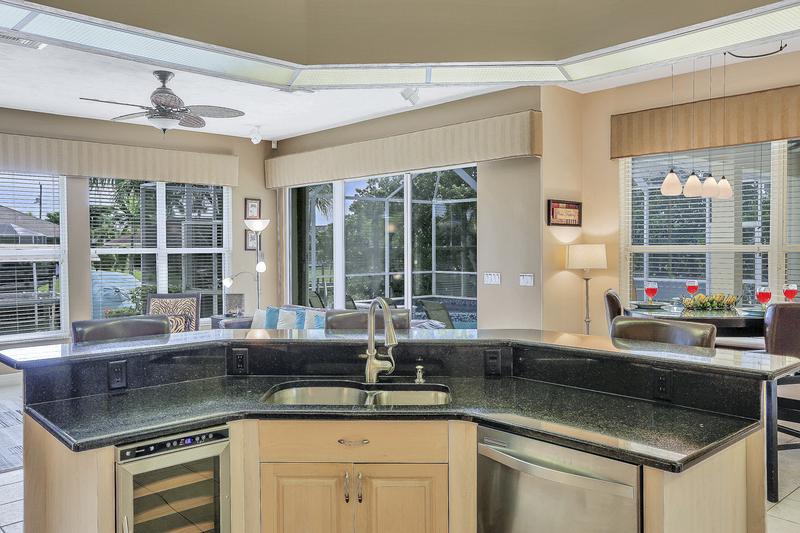 Brand new stainless steel appliances complete the Kitchen fit for the most demanding of gourmet cooks. The Kitchen even has its own wine cooler solely for wine and cold beverage storage so you need never be without a cooling drink. Breakfast seating can be taken at the breakfast bar on leather swivel high-top stools or at the breakfast nook overlooking the pool and spa area. 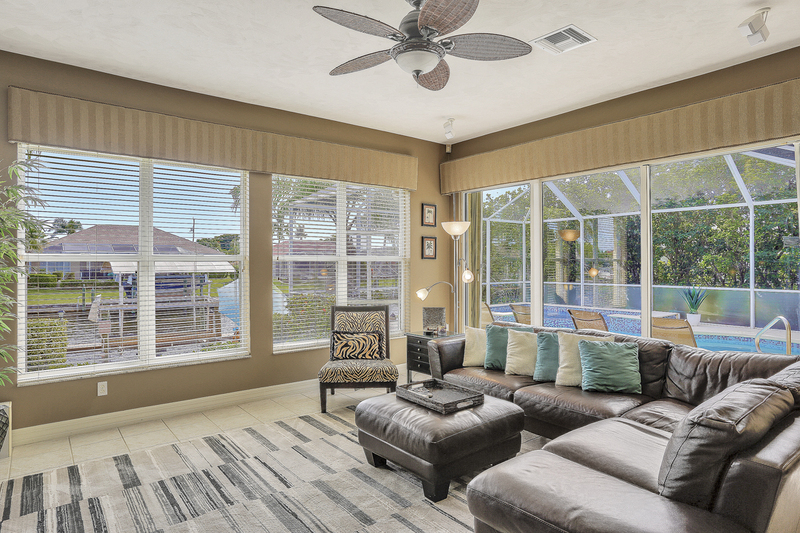 The Family Room enjoys sweeping views along the gulf access canal and large glass sliding doors provide views and access to the private pool and spa area. Sumptuously furnished with a leather sectional sofa and additional seating, the room also features a large flat screen HD cable TV and Bose surround sound. 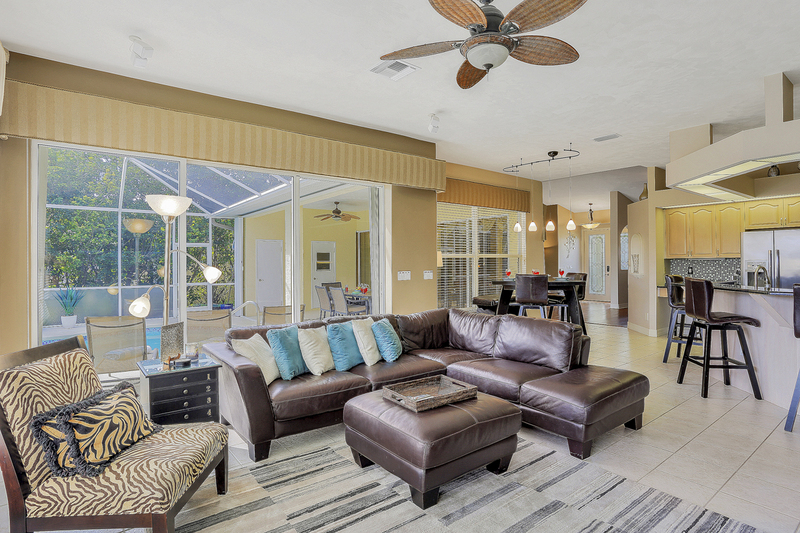 The Family Room also overlooks the large open plan Kitchen and breakfast nook, thus providing a very large living and eating space for all the guests. 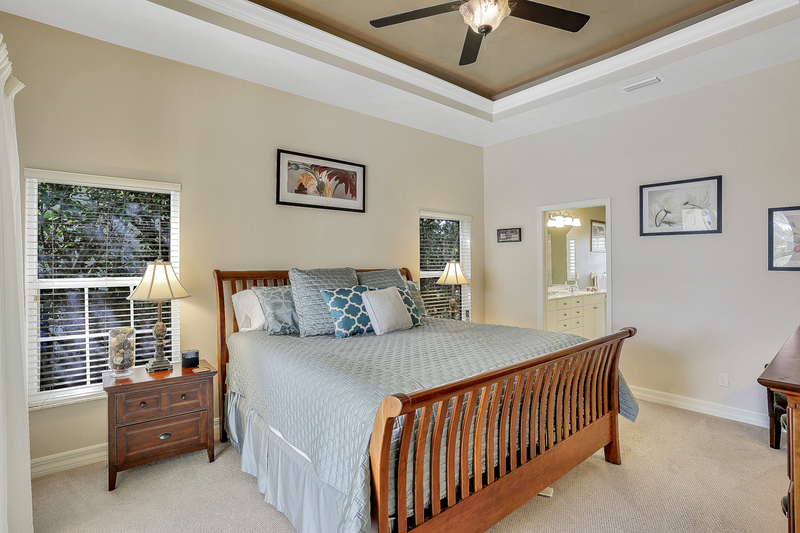 The Master suite is a calm retreat at the end of the day. The room glows with a cozy light in the evening time from the secreted lighting installed in the bedroom ceiling. Very comfortably furnished with a sumptuous 4-poster King bed, fine linen and large flat screen HD cable TV. 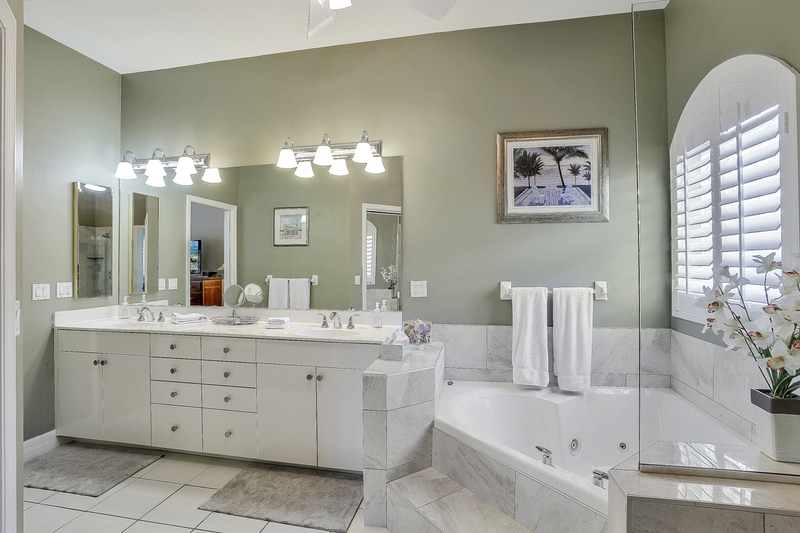 The adjacent huge Master Bathroom completes the feeling of your very own private sanctuary. 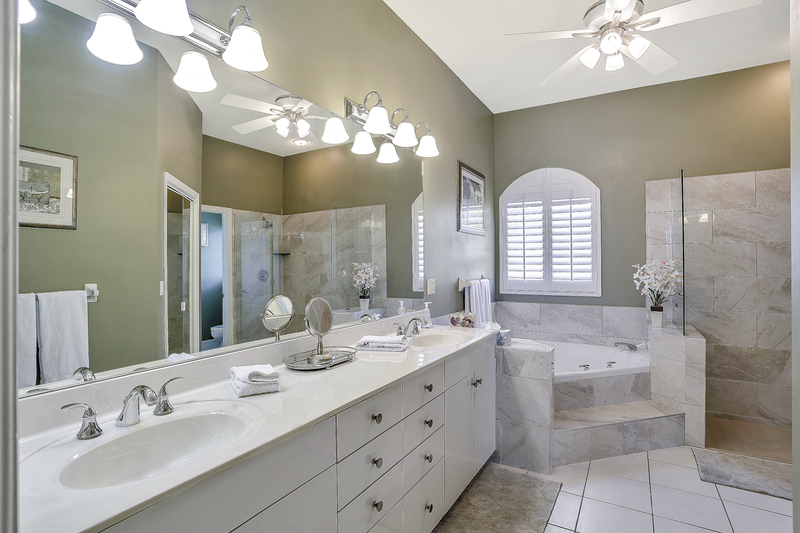 Continuing the upscale appointments, the Master Bath has a separate large walk in shower, jetted bathtub and his and her basins. On stepping out through the sliding glass doors, the privately screened freeform pool and deck area is oversized with plenty of space for lounging in the sunshine, alfresco dining or sitting quietly in the shade reading a good book! The electrically heated pool also has a resort size 8 seater cascading spa; a great spot for an end of the day cocktail whilst watching the sun go down. Uniquely, this pool and spa has been fitted with LED mood lighting. This unusual feature allows guests to light the pool and spa at night with a selection of coloured hues, to really bring the pool area alive at nighttime. 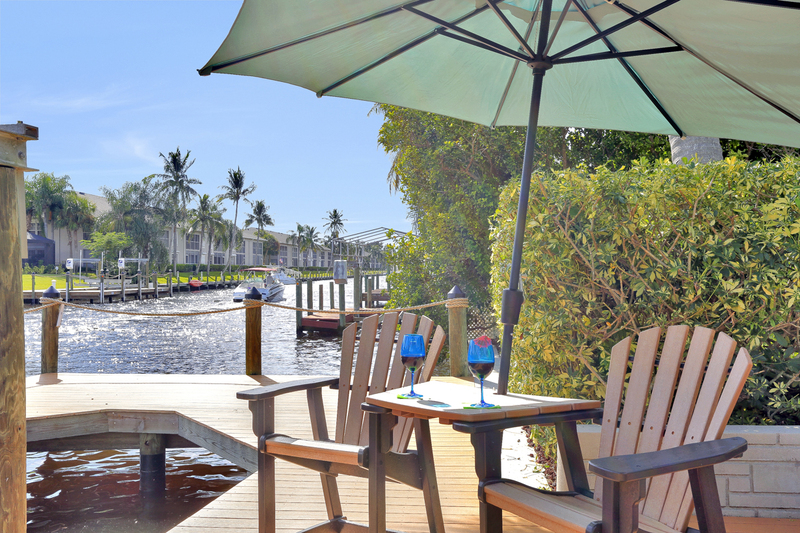 Steps from the screened pool area lead to your own private oversized dock with additional seating area. 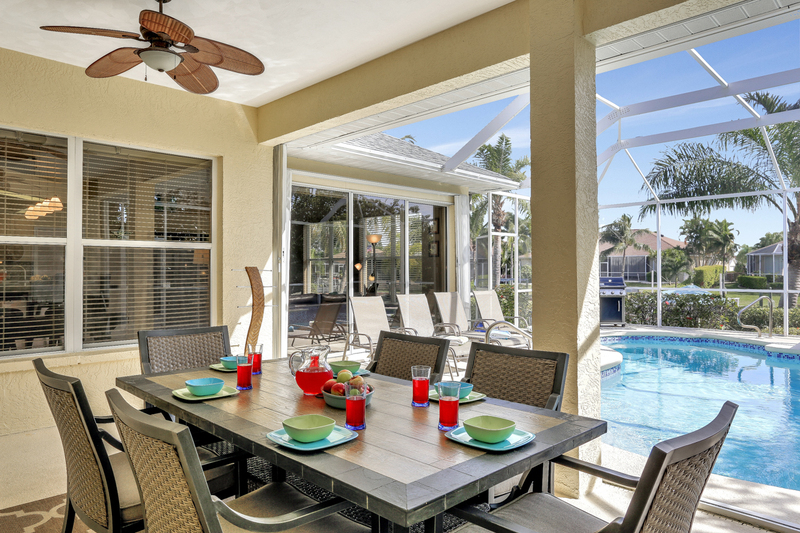 The home is also equipped with a large gas barbecue for outdoor dining and entertaining. 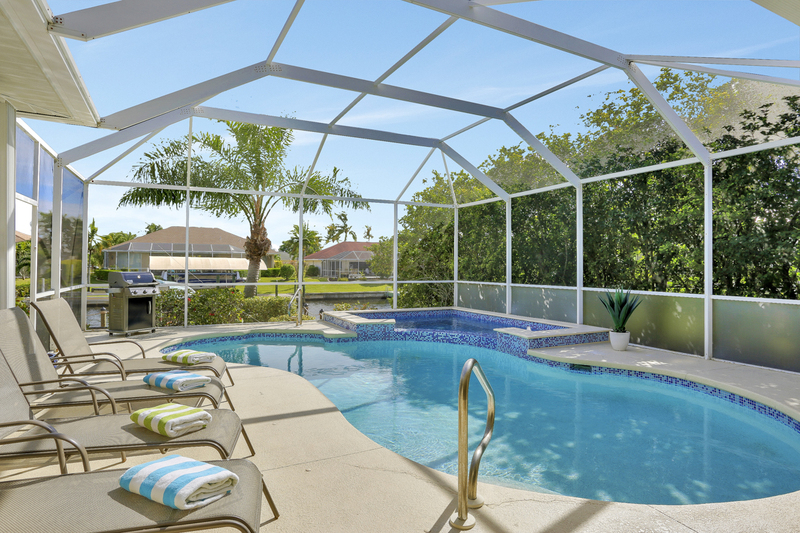 The entire surrounding outdoor areas of Villa Serenity Star have been lavishly landscaped to add privacy and provide the feeling of a luxurious oasis in the Florida sunshine.